Overcoming the legacies of oppression and prejudice is not an easy task. In Orlando, we are told that we can blame a lone Afghani-American gunman. How convenient in an era of growing angst and violence against Muslims. We forget the past and shift our gaze from the role of the US in millions of senseless deaths here and around the globe that continue year after year. As we grieve, let us do so remembering history and vowing to do what ever we can to create a different future. It’s the reason I felt compelled to write and share this post today. My career as an academic came later in life. It wasn’t something I had ever envisioned myself doing, but teaching seemed like an important way for me to share what I had learned. It was a natural progression from my work as an advocate with systems change initiatives for elders, tribes and marginalized communities. 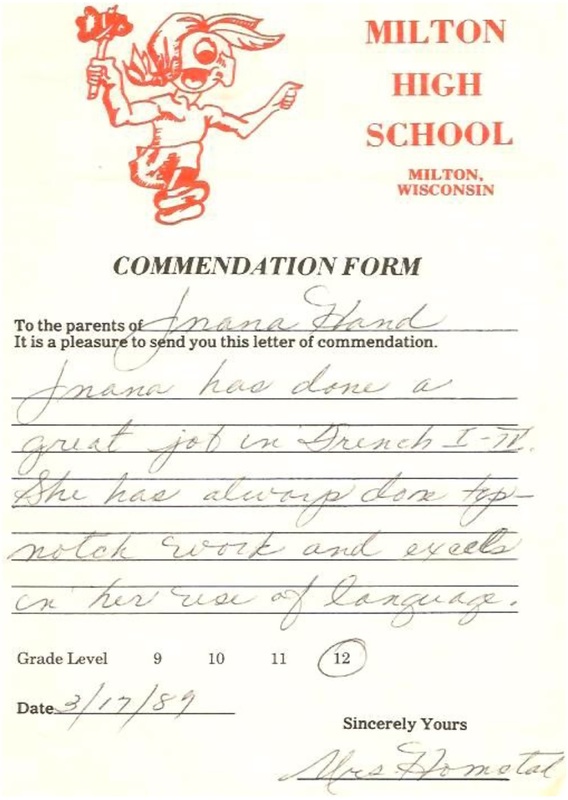 Fortunately, I had the benefit of working as a teaching assistant for my graduate advisor. He was a charismatic Chickasaw scholar of international acclaim, an award-wining “master teacher,” and a kind, ethical, and humble man. He allowed me the freedom to do things my way as long as I followed the rigors of critical thinking and supported my work on the basis of empirical objective evidence. With a model like his to follow, it’s not surprising that I choose to teach from a foundation of liberatory praxis, or critical pedagogy. I have described this approach in other posts, but honestly it’s now become cumbersome for me to try to find them on my own blog. The word “liberatory” is easy to understand without much of a definition. But as Freire (1998, 2o00) argues, to be ethical and effective, our efforts to improve conditions in the world need to be based on knowledge and respect for others and what they already know – praxis. Simply put, teaching from this foundation means meeting people where they are to engage in dialogue about the systems that oppress us all. Rather than forcing students to blindly memorize and regurgitate existing theories and beliefs, liberatory praxis provides students with opportunities to look at taken-for-granted circumstances and asks them to think critically about meanings and alternatives. 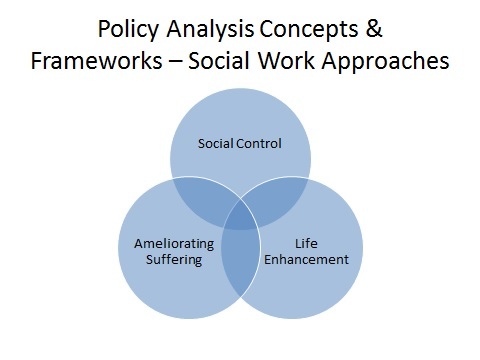 Yesterday, I was reminded of a framework I used in the past to teach social welfare policy. I had to renew my car registration and driver’s license, an unappealing annual task that required visiting two separate drab bureaucracies. As I waited in line or at the counters, I listened and observed. And I imbibed the depressing atmosphere, aware that staff were doing the best they could to function kindly despite the constraints of social control that the rules of their positions demanded. Again, I wondered about alternatives. Intuitively, many of us sense that the policies and institutions that constrain our lives limit our freedom. And they do so in ways that makes us feel shamed, demeaned, devalued, or judged as inferior on some dimension. It shouldn’t be surprising. 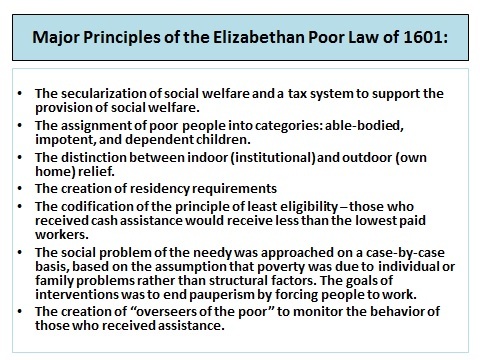 The values and assumptions built into many social welfare policies in the United States are based on sixteenth and seventeenth century British Elizabethan Poor Laws. These laws were meant to control people who were disinherited and displaced as the feudal system dissolved during the era of industrialization. Tenant farmers and artisans who were evicted from the land and their homes flocked to cities in hopes of finding some way to support themselves and their families. Notice how even this historical overview of the context of massive displacement and human suffering fails to mention the profit motive behind the plight of those who found themselves without the means to survive because they had been separated from the land and labors that had been theirs for generations. Notice also the ease with which the blame for their circumstances has been labeled as an individual deficit, “pauperism,” rather than a critique of the system that forced them to survive in whatever ways remained open. Following is a brief overview of the major provisions of the law that codified these assumptions and the punitive measures that were imposed in response. What a great tool this was to control the rabble in the old and “new” world! As in Britain and elsewhere, there have always been far greater numbers of people who are poor and propertyless than there have been among the propertied ruling elite. These assumptions about human worth – who is worthy and who isn’t – are built into the institutions, policies, and more importantly, the unquestioned values people are socialized to see as right and normal. Some of our social welfare policies were grudgingly enacted to ameliorate suffering. But many have been eliminated or significantly reduced of late. The oppressive net has been becoming ever more controlling and deficit-focused in recent years, and sadly, those who are next in line to be displaced have internalized the same assumptions about the individual-deficit causality of poverty. Shame is a powerful way for the few to rule the many. But social control is never a laughing matter. We have choices. I have seen the hope and excitement that is possible if programs are based on a foundation of life enhancement, using liberatory praxis as a method to open up possibilities. The powerful transformations that can and do happen in people’s lives have been profound. Paulo Freire (2000). Pedagogy of the oppressed (30th anniversary ed.). New York, NY: Continuum. Paulo Freire (1998). Pedagogy of freedom: Ethics, democracy, and civic courage. Lanham, MD: Rowman & Littlefield Publishers, Inc. This morning, I reluctantly emerged from a hypnagogic state. I wanted to remember my strange dream. It was laden with meaning that I knew would escape me as soon as I awoke fully. Yet the early morning sun streaming through the eastern window and singing parakeets called. It was time to get up. Still, I lingered a few moments and then scribbled what I could remember in the margins of the cryptogram puzzle book by my bedside – the only paper available. I saw a word floating in the air of my dream – shibboleth. It seemed important, but it’s not a word I ever remember using. I’m sure I’ve read it and looked it up more than once. I’ve probably written it many times before in the margins of some of the obscure texts I was trying to decipher. I have a habit of sitting with my unabridged dictionary on my lap at such times, scribbling words and definitions in the margins of my texts. Sometimes, it’s easier for me to keep writing definitions than it is to find the ones I’ve already written many times. Does this word offer a clue to help me continue working out a tricky transition in the book about Ojibwe child welfare I’m working on? A shibboleth, in its original signification and in a meaning it still bears today, is a word or custom whose variations in pronunciation or style can be used to differentiate members of ingroups from those of outgroups. Within the mindset of the ingroup, a connotation or value judgment of correct/incorrect or superior/inferior can be ascribed to the two variants. What does the word shibboleth imply about the liminal space between the Ojibwe and Euro-American settler cultures I studied years ago and continue to ponder today? Certainly the past continues to influence the present. I honestly don’t know what to make of a dream where the word shimmered in the air just as I awoke. The notes I scribbled in the margins of my cryptogram puzzle book don’t seem to offer much. All people create separate worlds in the past where they can revisit. [I think this is what I was doing in my dream.] Some get caught there, and others are stuck halfway in-between. The worlds we create can tell us a lot about who we are and the things that matter most to us. I couldn’t even remember how to spell shibboleth when I awoke, so I gave it my best guess and Google did the rest. Honestly, this is something I will need to think about more. In the meantime, the final cryptogram puzzle I solved before going to sleep last night reminds me of one of the pressing tasks I need to do today. Yesterday, I finished drafting the first half of a book I’ve been writing. I know it’s just half because I reached a transition point. I had to alternate between living “in the field” for several months to conduct a study of child welfare in an Ojibwe community with living in a distant Euro-American city to teach at a university. The first field immersion adventures are now written and a double teaching load is about to begin in this past reality. I’m not sure what if anything to include from those days at the university. At this point in the telling, I remember how difficult those transitions were. In many ways, I was still an outsider. Only the context had changed. I relied on the same critical ethnographic frame of mind and habits to make sense of my time in academia. I continued to write fieldnotes, just in a different setting. After experiences in several different universities, I had collected a series of stories. But no journals were interested in publishing them, even though I felt the messages were important. Finally, I gave up trying. It’s one of the main reasons I began blogging. This morning, I revisited the last version of the manuscript and decided to share it here even though it’s rather long. My experiences trying to find a publisher actually influenced the title and brief “About” statement for this blog. I did share edited versions of some of the stories in earlier posts when I began blogging almost three years ago. This morning I realized how much I have always regretted the need to separate them from the context. Although universities have been proclaiming their commitment to diversity in recent years, evidence shows that disparities still exist for faculty of color, particularly for Native Americans. This is true for social work programs as well, despite a professional code of ethics that professes an emphasis on social justice. The values that guide the hiring, performance evaluation, and promotional policies of universities and social work programs are often incongruent with those from cultures other than the professional class of Euro-Americans in positions of power. Descriptive data paint a bleak picture of the difficulties faculty of color face in academia, but these data do not capture the multidimensional challenges for those whose cultures differ. 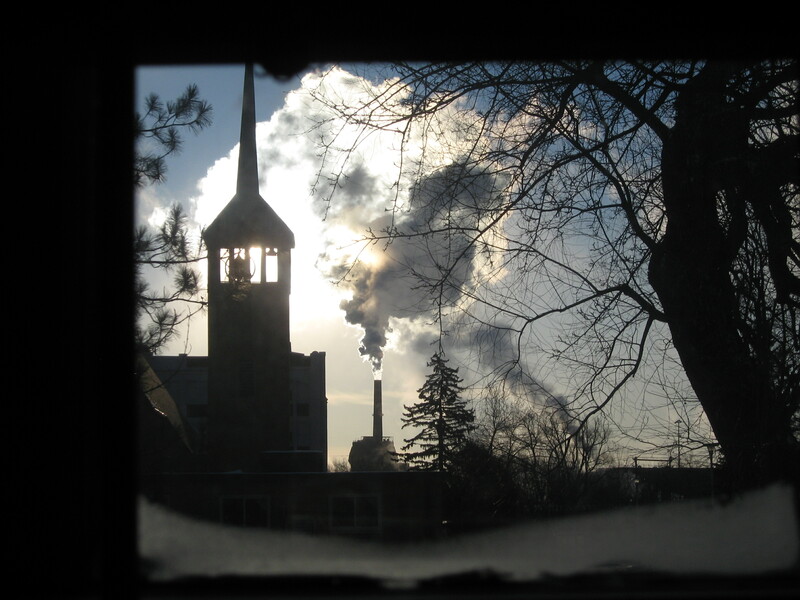 This essay interweaves a series of essays that are drawn from the participant observations of an Ojibwe scholar in academia in order to illustrate the individual and institutional costs associated with discrimination and exclusion. Despite these lofty proclamations, my experiences as an Ojibwe scholar in academia have made me realize that universities are not as accepting of differences as they claim to be. I know that my experiences as a scholar of color are not unique. In general, faculty of color have continued to be under-represented in academia. In 1980, less than 5 percent of full-time faculty were African American, less than 2 percent were Hispanic, 2 percent were Asian, and less than 1 percent were Native American, when cumulatively people of color composed about 20 percent of the U.S. population. By 2003 people of color were almost 33 percent of the total population, and the proportionate representation of faculty of color within “predominantly White colleges and universities” was even more troubling: 5 percent of full-time faculty were African American, 5 percent were Asian, 2 percent were Latino, and less than 1 percent were Native American. Faculty of color tended to be “heavily represented … at the lower ranks of lecturers and assistant professors” merely because they were different. These numbers often mean that a faculty member of color may be the only person of color in their department at a given university, and one of only a few in the overall institution. To address the lack of diversity, universities have focused on recruiting faculty of color. Often, these new faculty are expected to meet not only the universal requirements for all faculty (teaching, scholarship, and service), but also to shoulder the university’s diversity initiative. This “shadow curriculum” means extra duties–to sensitize White faculty and administrators on diversity issues, teach diversity courses, serve as tokens on university committees as the minority voice, present workshops on topics of diversity, and advise students of color. In essence, some scholars of color see this approach as harmful window-dressing that marginalizes or ghettoizes the responsibility for implementing diversity programs, placing the burden on faculty of color without making necessary institutional changes or providing necessary recognition and supports for these additional expectations. The situation for Native American faculty is particularly challenging. For decades they have represented less than 1 percent of full-time faculty. They are also less likely to attain tenure than members of other ethnic groups. In an effort to highlight the experiences of Native scholars in academia, a special issue of the American Indian Quarterly focused on the accounts of Native American students, faculty, and staff and their allies. Many Native Americans in academia “have found themselves in tough situations because of their political views, teaching styles, and quite simply, because of their race and/or gender.” Author after author described how they were systematically marginalized by those in power in university settings. Other Native American scholars also described negative experiences in academia. In part, as Shawn Wilson argues, these experiences reflect contrasting epistemologies. Indigenous peoples operate from a foundation of relationship, while those of European immigrant descent, who compose the majority of tenured faculty and key administrators, value competition and emotionally distant objectivity. Perhaps these differences also reflect deeper cultural contrasts, as Rupert Ross suggests. 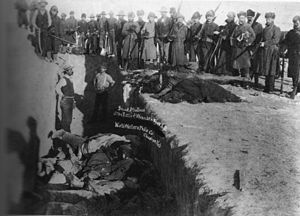 The Ojiway and Cree peoples Ross served as an Assistant Crown Attorney operated from a belief that children were born in a state of “original sanctity,” as gifts from the Creator, as “good,” a profound contrast to the belief of Euro-Canadians that children were born in a state of “original sin,” as evil. The institutions that develop from these profoundly different worldviews likewise differ. One nurtures and protects without coercion, and the other polices and corrects. One builds supportive networks around those who are experiencing difficulties because they are viewed as important members of the community, the other rejects those who do not fit because they are viewed as easily replaceable. One views leadership as a sacred responsibility to exercise wisdom, generosity, and mercy to ensure the well-being of all one’s relations, the other views power as a symbol of personal superiority and a divine right to exercise dominion over other people and the natural world for one’s personal gain. Social workers are sensitive to cultural and ethnic diversity and strive to end discrimination, oppression, poverty, and other forms of social injustice. Like the majority of Native American graduate students Gordon Limb and Kurt Organista studied, I entered the field because I was drawn to the compelling traditional mission to help disadvantaged people while working to address structural inequalities and oppression. As the following stories illustrate, what I experienced and observed in three different universities was definitely not in accord with my expectations. I wrote these stories as a way for me to make sense of my experiences and observations, and sometimes, as a way to survive by interpreting events through a different cultural lens, seeing the lessons, absurdity, and humor in situations where I had very little power to prevent individual or community harm. My purpose for sharing these stories is to heighten the awareness of faculty and administrators to the view of academia from a different lens in hopes that together, we can create a more inclusive future. Lest I forget, I want to record my impressions and reflections of this living experience. As a new assistant professor, rather than trying to find an apartment in a strange community, I chose to stay in small, dark concrete graduate student apartment complex. This proved to be a short stay given not only the oppressive administration but also the health dangers posed by monthly pesticide spraying and the wall-mounted furnace that belched out long, hairy, black dust. Even renting this place was an affront to my spirit–an adult who has held many responsible positions in my career. I was made to feel like an errant child without agency or legitimacy by the omnipotent “office of residential life,” and by the department chair who had to advocate on my behalf. For someone who is used to feeling a sense of vision and freedom that comes from living with a vista of wetlands, forest, and sky, in a home where no one may enter without approval, the loss of privacy and freedom was all the more notable. The loss of beauty was all the more acute. And being treated like a child was all the more hurtful and angering. These feelings have relevance to the topic of my research: institutions and the paradigms on which they are founded. For a people who are prepared to be competent and self-sufficient in a challenging environment, with finely tuned skills and sensitivity, Euro-American society and institutions are indeed an affront to the spirit. The rigidity, the belief that people need to be policed in order to work or live according to arbitrary behavioral and material standards is insulting and oppressive. It was not only the ugliness, the architectural heaviness of this structure, and the absence of light and windows to the world, but how it was reflected in the social structures, the everyday interactions with those in petty bureaucratic positions that were also an affront to the spirit. For people who have been acculturated to live according to the path of life, the oppression of all types of judgments and the loss of freedom is especially acute. This theme runs through Euro-American social structure, with its rigidity, heaviness, negative judgments of the basic nature of people, and policing functions. The very foundations of Euro-American social structures and institutions limit choice, vision, and joy. You work and strive and behave to achieve a superficial outward appearance of conformity because you must–otherwise others will judge you as deficient and further limit your rights. The question becomes how to communicate this profound paradigm difference. I should be grateful for the experience of living and working in a situation where these dynamics are excruciatingly apparent. And perhaps I am–the fact that I have become conscious of some of the dimensions and complexity of oppressive macrosystems is at least for now a way to cope. But I am afraid I will forget–hence this memo. Experience has taught me that the brutality of some institutions (such as state agencies) and the pettiness of the bureaucrats who staff them (perhaps because this is how they can best cope with their own oppression) can have soul-deep negative effects. I want to remember and to continue to reflect on these forces of hegemony. I went to see a documentary called “A Long Way from Home.” On a weekday evening, I entered a dimly lit basement with folding chairs and saw a cluster of people gathered in an alcove at the bottom of the stairs. This was advertised as a screening of a Native American documentary. I expected food and laughter, and a warm welcome. What I encountered was quite different–an uncomfortable hello from several fifty-ish White women in flowing scarves. There were maybe ten people scattered around the room in folding chairs awaiting the evening’s event—a lecture and video presentation. 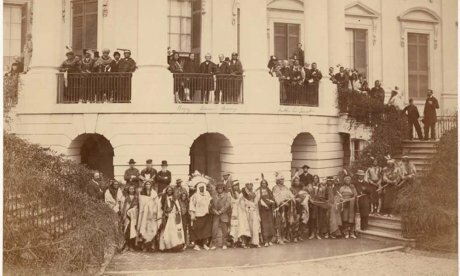 Most of the audience were Euro-American, with the exception of four young women from Africa. (I only learned this later when they asked questions at the end of the presentation.) I found it odd that no one thought to ask the very small audience to introduce themselves. One of the women present introduced the speaker, a former faculty member who had developed the video. The speaker was a small gray-haired Euro-American woman in a black pants suit and flowing bright scarf that kept falling from her shoulders. As she spoke, she continually pulled at the scarf, readjusting it, only to have it begin slipping off again. She briefly described her video–a chronicle of the efforts of an Indigenous group to rebuild their tribal identity and culture and to obtain federal recognition. The video was disappointing, and even troubling. Here I was in a group of people who had little interaction with Native Americans. The documentary left a strong impression that there were no real Native American cultures anymore–only those that were being reinvented. (This is not to say that cultural revival is not important. It is!) There was no mention of the more than 500 federally recognized tribes in the United States, the more than 200 Native languages still spoken. And the questions were even more disturbing. It was one of those times when I did not even know what could be said in this setting, so I remained silent. I did notice that the four African women kept looking at me. It is true that I am rarely identified as Native American when I am away from northern Wisconsin, although I did resemble a number of the people in the video. Then, an amazing thing happened. Each of the four African women asked questions. One asked a question about cultural bias. “How is it possible for someone outside of a culture to represent that culture in an unbiased way?” The speaker responded that she had taught journalism, and each semester, she began her class by writing all of her biases on the board. She explained that because she knew all of her biases, she was able to report from an unbiased perspective. The next question was a complex query about the effect of colonialism on indigenous peoples around the world. The speaker’s response made me feel as though I had entered not just a strange culture, but had also somehow been transported back in time to the 1950s. 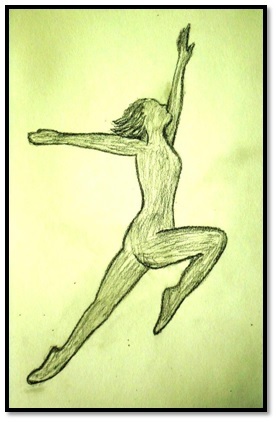 She threw her ever-slipping scarf over her shoulder with an exaggerated movement, raised her right arm to the ceiling as if in a dance recital, and stood tall. As she uttered these remarks, she glided across the space in front of the audience, first bending low and reaching toward the floor, throwing her slipping scarf over her shoulder repeatedly, and then, reaching toward the ceiling. The questioners were silenced. The only people who spoke afterward were Euro-American academics in the audience, each sharing what they knew were the crucial issues for Native American people. I wondered as I listened how many had ever spent time on a reservation, or visited an urban Indian center. Out of politeness, I stayed until the event ended. On another occasion, I would have sought out the women from Africa. Their questions reflected such astute insights. I wondered if their reactions were similar to mine. The arrogance of someone categorizing continents! Yet, my emotions were raw. I needed to reflect on this evening, so I walked silently up the stairs and out of the building. As I headed toward my car in the dark, I suddenly understood that time warps are real. I had not realized before that difference here had that added dimension. I doubted that I would be able to reach across this double divide to speak to people who already knew all of the answers about Native people. I felt as though I was a long way from home–a home not only in place but in time. And I wondered if I would ever find my way back. Let me write about a metaphor of power before I forget. In this story, I lived under the oppressiveness of invalidating judgment for over two years. Interestingly, those who made this judgment claim to operate from a stance of strength-based social work practice. In fact, some of them have authored works that purport to teach others how to operate from a social justice framework. But that is another story for another time. The story I need to record today is about the illusion of power. It is a memory of the past, but has implications for the present and the future. It was graduation day at the university. A prominent faculty member, a self-proclaimed feminist who was scheduled to deliver the graduation address later in the day for MSW students, arrived dressed in high-heeled clogs. I watched her walk as I took my position behind her in line as we walked toward the auditorium, worried that her clipped and unsteady gait might spell disaster. Although my inclination was to reach out to help steady her balance, my culture had taught me it is rude to intervene in another’s path without an invitation. Thankfully, we arrived at the hall without incident. As I looked at the prominent presence of Tribal elders and leaders on the stage behind him, I thought this was a hopeful sign. The governor than noted, “the first best state citizens were not the explorers or timbermen or miners who came, or those who built the railroad that spans the state. The first, best citizens were the farmers and ranchers who made it their home and who, through hard work and sacrifice, made the state what it is today.” As the governor said this, I heard a collective gasp from the anthropology faculty, and many others scattered throughout the arena. Yet, my social work colleagues appeared too enraptured with the governor to notice. I wish my colleague well. Yet, I witnessed how this need to grip the symbols of power often resulted in unconscious ways of invalidating others, be they students or colleagues, when she was not on stage in the public eye. Her lack of grounding also affected Native people in other ways. She developed the diversity class for master’s students, and only included Native American literature that confirmed misinformation about the disfunctionality of contemporary Native Americans in a state, community, and institution that already had significant anti-Indian biases. I share this story to encourage others to be aware of the invidious seductiveness of the symbols of power. We are most tempted to grasp them when we are most fearful, least grounded, and least balanced, and without balance, we can do great and lasting harm to others. This morning I awoke with a memory of a symbolic experience that has remained dormant for more than a year. The setting was the annual college retreat. It was a time of significant turmoil in the school of social work. One colleague had made an unfortunate decision. He did not cite the sources he used to create a fairly unimportant bureaucratic document, although he did insert a blank page entitled “Acknowledgments” at the beginning of the document. He was pilloried behind his back by faculty for his oversight and proceedings were initiated by the school to sanction him in the upper reaches of the university. It was a hurtful, ugly time–and the response was so out of proportion to the alleged offense. There was an unacknowledged context. This colleague, relatively new to the system, was different in notable ways. Perhaps it was a legacy of working-class roots. Yet all he really wanted was to belong, to be respected. From the start, his difference and his desire to fit in were a point of vulnerability. The response of the system was to marginalize him, to isolate him, to deny him the very things he most wanted. From the margins, he produced the document. No one helped, although a number of other people were responsible for collaboration and final oversight. The “breach of professional ethics,” or “plagiarism” as it was labeled, was defined as his alone. And the system set out to sanction him in the most profound ways. It was the beginning of my second year. I tried to find less hurtful solutions—solutions that would enable people to resolve differences in a way that promoted face-to-face honesty and healing. My pleas went unheeded. To pathologize an individual for one misjudgment is hardly an example of “strength-based and empowering practice.” We are all more than one mistaken action. My colleague also was good at research, kind to students, and supportive of the newer members of the faculty. Yet his strengths were not acknowledged by the system; only his deficits were the focus of hallway and closed-door conversations. His plight was particularly salient for me. I was also isolated. 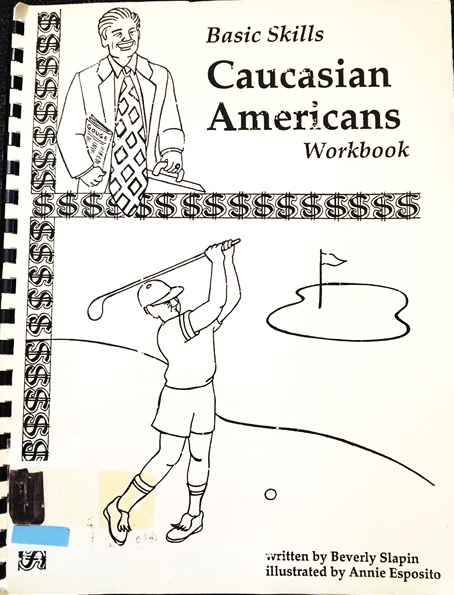 As the sole faculty person of color in the school, an Ojibwe in a state that was particularly prejudiced against Native Americans, I was on the margins like my pilloried colleague. He had been consistently kind and welcoming to me despite his treatment. With this divisive turmoil brewing, social work faculty attended the college retreat. It was a divided college, attempting to merge unlikely disciplinary partners who had little in common with social work. In an effort to promote greater understanding of each other’s profession, the chair of each school briefly addressed the assembled audience of more than 100 faculty and staff. The chair of social work talked about the teamwork and unity of the school, how supportive faculty were of each other. I wondered what planet I was on as I looked around and could see the various social work factions seated in distant corners around the large auditorium. The speakers droned on for the entire morning. I was a few minutes late arriving. The tables were all filled, making it hard for me to see the centerpieces that specified the birth month. Finally, after circling the room a number of times, I discovered “February.” I approached the table and noticed that it was full. Two of the people at the table, one a colleague from my school and one from another discipline, spoke in unison. “There isn’t any room here. Why don’t you sit at the overflow table.” On the margins was the overflow table, empty of place settings and occupied by a sole colleague from the college. He was not faculty, he was support staff–an unacknowledged source of divisions. He was a computer technician originally from China. And he looked so alone. I asked him if it was okay for me to join him. He did not say no, so I sat down. We talked as we sat alone through the meal, and it was an interesting, although uncomfortable, conversation across cultural, language, disciplinary, gender, and age divides. As lunch ended, my pilloried colleague sat down with us as well. The misfits by virtue of race, class, and status in the hierarchy shared a table on the margins. This symbolic encounter remains with me, although my colleague is no longer here. It is symbolic of why I feel it is so hard to stay. In the intervening year, I still sit on the margins although I have tried everything I can to bridge divides without compromising my integrity. I am accepting the likelihood that it may not be possible for me to find a place at the table here. I know there are other tables in other settings where differences are welcomed, and even celebrated. And I know there are many in this world who go hungry, who have no table that welcomes them. Those with privilege have a responsibility to remember that their work is to make sure that hunger and exclusion are ended. “Why are you so different?” my colleague asked. I suspect that, in part, my response to this question has contributed to being ostracized and pathologized by faculty who are unable to hear the many ways this question could be asked and the many possible, legitimate, responses. As a child, I asked this question many times. As I pondered the amazing diversity of the six-pointed shapes of snowflakes that fell on my dark mittens on a winter day, I asked “Why are you so different?” with a sense of wonder and awe. As a child who grew up between two cultures yet not fitting neatly in either, I asked myself “Why are you so different?” with a sense of genuine puzzlement. Embracing that sense of difference actually led to authentic efforts to learn to understand the world from as many diverse perspectives as possible. My favorite children’s story was about the Churckendoose, a little bird that was a mixture of a chicken, turkey, duck, and goose. Difference in this story was simply that, difference. There were no values assigned to being one creature or another, and no interpretations of being superior or inferior as a result of difference. As a teenager, the question was more emotion-laden. I wondered why I could not simply be a part of the cliques that reached out to include me, but not others whose difference was more visible and seen as inferior. (These were the people who were the most interesting to me.) Difference that meant inclusion or exclusion was based on family socioeconomics, religion, appearance, perceived intelligence (either too much or too little), or being “cool,” whatever that meant. I respected peers who did not seem to care about their exclusion. Instead of joining cliques, I reached out to those who were excluded, not in an attempt to forge an anti-clique, but to understand the position of difference as a somewhat consciously chosen stance of resistance. I admired the courage of those who were willing to carry the responsibility of thinking critically, who were willing to challenge norms and social expectations in visible, creative ways. 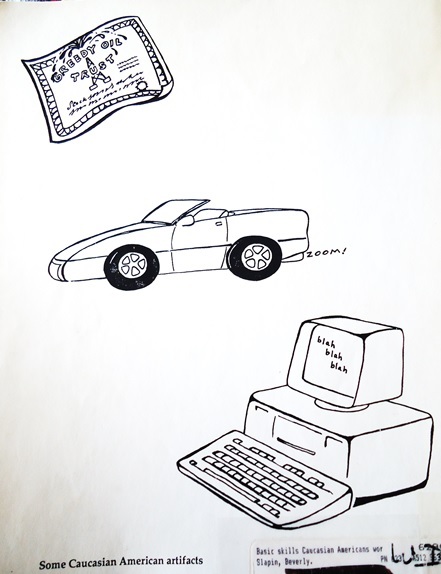 As a young person searching for a place to belong, a role and career that had meaning, difference had new connotations. It was time to believe in the message of the Churckendoose, a time to explore as wide a range of diversity as possible. I lived in the hills of Appalachia and on Indian reservations, and worked in the inner city of Chicago while I attended an exclusive Catholic women’s college. I survived the streets of Hollywood, and experienced the possibilities and disappointments by being part of a New Age commune. Among my friends, I have counted priests and prostitutes, artists and legislators, people who were poor and rich, blue collar workers and university professors. Difference enriches my life and my understanding of the world. Like the snowflakes on my mitten as a child, it is a source of never-ending wonder and engenders curiosity. I did not hear this sense of wonder and curiosity in my colleague’s question. It was intoned in a way that sounded more like an indictment. For more than a year, the indictment has remained. Yet perhaps, just perhaps, is there a possibility of building understanding? As long as I am here, I am willing to try to model a sense of wonder and openness to new experiences and different ways of seeing the world that are liberatory. The lesson of the Churckendoose has served me well for a lifetime. I hope that I am able to bridge the divide between those who see the need for predictability, stability, and a degree of certainty, and those who welcome ambiguity and the as-yet-unknown as an opportunity to explore a more inclusive world. I am reminded of a passage from Hyemeyohsts Storm’s work. If we place people in a circle, facing inward toward a multifaceted object in the center, each will see only one side, and each view will be incomplete. If each person can share their perspective with others in the circle, a fuller picture will be possible for all. Afraid of difference, we will see only what falls within our limited gaze. How can we teach this partial frame as the one truth? Why would one want to insist that this is the only true reality? And why would anyone be willing to believe such a ridiculous assertion? Difference is the rule, not the exception, and a wondrous gift of wider, deeper vision and understanding. It is at least honest to ask, accusatory or not, “Why are you so different?” It is, hopefully, the beginning of an ongoing dialogue. When I am almost 60, I discover a new avocation: washing little rocks that I have excavated as I dug gardens and a small pond in my yard. Although time consuming, I want to line the little pond with rocks that came from that very spot. It has given me time to reflect on many things. I am sure my neighbors, if they see me, will think I am crazy as I sit for hours scrubbing decades or centuries of dirt from something that appears, at least in this cultural context, to be so worthless and ordinary. Yet, as I watch dusty brown lumps transform into multi-colored, uniquely textured, and variously shaped stones, I begin comparing it to the work I do as a professor. I have also wondered about the paradox of too much knowledge and naming. I have not ever had a course in geology–strange, given that I have taken courses in almost everything else. I cannot name any of the rocks: I don’t know when, where, or how they were formed. I wonder, if I did know, would I be able to appreciate their loveliness without cataloging, ranking, or judging in some way? Would I be able to see each individual stone in its uniqueness from a more educated, scientific perspective? I honestly don’t know. I do know that I have not run off to buy a book or enroll in a geology course. I can usually (but not always) apply this principle of nonjudgment when I work with students. I can rarely apply it when I work with colleagues. Again, I ponder this difference. And I do run off to buy more textbooks to understand how I might do a better job of respecting those who have power and use it to oppress others, always with the goal of becoming more effective at ending oppression, but the answers still continue to elude me. I also ponder the journey these stones made. What was the world like as they formed? Where did they begin their journey? Where have they traveled? And what have they experienced that has polished the surfaces of some and splintered others that are jagged and sharp-edged? (The ones with jagged edges don’t go into the pond: they serve as a ring around the edge.) Is this the difference, at least from the perspective of an Ojibwe academic, between students and colleagues? Is it that I can see the smooth surface of those with less power, and only the jagged edges of those with power? Is my response to power differentials related to an automatic resistance to the legacy of colonial oppression? Or is it related to the Tao saying, a recognition that status is really only a social convention maintained by those in power for their own short-term benefit that is ultimately unfulfilling? Have the hard times experienced by those without power polished their surfaces, while those with privilege remained jagged for lack of transformative challenges? I wash rocks and take the time to get to know students, but my colleagues tell me I should be more “productive.” Yet, to find the beauty in everyday life, to plant gardens that have begun to transform my working class neighborhood, is not wasted time. It has expanded possibilities. To help students believe in themselves, and to model how to work with clients in an authentically empowering way, will perhaps be of greater benefit than yet another journal article or conference presentation. It is the living art of washing rocks, or touching lives, that lets the best in others shine through. Taking the time to find beauty in others is surely needed in present and future times. It is probably wiser to help students develop their own capacities to challenge accepted social constructions that limit opportunities for all of us to express our inner beauty and celebrate the inner beauty of others. The difficulty is to be in that liminal space between those without power and those who use power in oppressive ways, to buffer those without power from harm without harming those who use power in hurtful ways, to be like water and benefit all. Can it be that this buffering, like the power of water, will wear down and smooth the jagged edges? It is tragic that three students have committed suicide in the past two years. The faculty who worked with the students are grieving and confused. In an effort to heal, the head of student counseling services came to discuss suicide during the faculty meeting yesterday. I did not know the students who died, so as a person on the margins, my reaction to the discussion was very different than that of my colleagues. In fact, the discussion left me deeply troubled. The focus was on a new university policy. In order to reduce liability for the university, faculty would be required to force suffering students to meet with the dean for possible expulsion. The head of counseling services explained that suicide was a form of violence perpetrated by imbalanced individuals on those around them. They needed to be stopped. A while ago, my partner shared a story he heard on public radio about the experiences of researchers who were conducting a study of a community of chimpanzees. Early in the study, the researchers noted that about 5 percent of the community appeared to exhibit all of the characteristics of depression. They stayed on the periphery of the community, they rarely engaged in social activities, and they appeared lethargic. With the best of intentions, the researchers decided to treat this isolated group for depression, so they removed the “depressed” chimpanzees from the community and worked with them. The treatment seemed to work. But each time the researchers returned to the troop, they noted that new chimps had taken up posts on the periphery, and they too were removed. At the end of the year, the whole troop was dead from an undetermined cause. We need to create a space to truly listen to what they are trying to tell us about a world that has become toxic to the most sensitive among us. It may be the world of our classrooms. It may be the world outside. How can we, as social work faculty, learn from the sentinels about our own practice as teachers and advisors? Are there things we need to change about how and what we teach to create a place where sentinels can preserve a sense of hope and possibility? I do not have the answers to these questions. I grieve the deaths of these students even though I did not know them as individuals. And I grieve the lost opportunity to explore this issue in a thoughtful way with others. Encouraging awareness and sensitivity places students at risk, doubly so because the interventions described yesterday are so inadequate from my perspective. These are not evil people I have described. They all have many strengths and have made some important contributions in their fields. Yet, as these stories show, those who unconsciously serve as gatekeepers to protect the status quo can shatter the self-confidence of individuals with less power, destroy promising careers, or even contribute to the despair that leads some people to commit suicide merely because they are different. Administrators and faculty with privilege in positions of power carry a responsibility to be aware of the consequences of their actions. These stories are my attempt to underscore the urgency for those with power in academia to become aware of the costs associated with exercising power and privilege in ways that are disempowering and oppressive, rather than ways that are liberating and enlightening. I have witnessed the consequences of gatekeeping for gifted faculty colleagues, whose differences in culture and sexual orientation made them vulnerable. Many were pathologized and forced out of academia because they just “didn’t fit.” The racism or homophobia they faced in classrooms (and among White heterosexual faculty) was attributed to their inability to teach, rather than as an opportunity for multicultural teams of allies to dialogue with students about issues and solutions to the problems of discrimination. The challenges my colleagues faced as publishing scholars were due more to the shadow curriculum they shouldered as “the” diversity program that Brayboy writes about, rather than to their lack of competence or commitment. I have witnessed dedicated students from disadvantaged backgrounds struggle to obtain an education to help others in their situation, only to be told that they were not “graduate material” for specious reasons. And I have witnessed other sensitive students driven to despair, and sometimes, to suicide. These are not individual pathologies. These are serious structural issues we need to address if academia is to live up to its aspirations to contribute to a future that is more welcoming of the wondrous diversity that characterizes our nation and world. As I pondered these reflections over the years since they were written, I now view them as acts of everyday resistance to the colonial privilege that dictated how everything I said and did was interpreted. When faculty and administrators in a social work program publicly refer to those in their midst who are different as “isms,” (i.e., the targets of racism, sexism, classism, heterosexism, ageism, ableism), something is amiss in terms of an authentic commitment to respecting diversity and working toward social justice. Like bullies on a playground, the status quo in academia has the power to dictate the rules of the game and the terms and limitations for inclusion of those who are outsiders, those who are different in some way. While outsiders often know the rules and the consequences for resistance, they may choose, as I did, to stand in integrity, to protect those most at risk as best they can for as long as they can from arbitrary abuses of power, and to give witness to the everyday injustices, describing them through their own lenses. But it will take far more than one or two faculty members to provide support and encouragement for colleagues of color, to collaborate on innovative ways to transform discrimination into learning opportunities for students, to advocate for students who are facing discrimination, and to serve as whistle-blowers when all other avenues fail. “Why do you have to be so different?” This was asked of my Native American colleague during our last year. It was asked because she presented alternative perspectives at faculty meetings and challenged procedures and practices that were not at all congruent with the stated social justice mission of the program. The question seems innocent on the surface, but it gets at the very core of what was wrong–an organizational culture comfortable in its White privilege and content with the easy road of pathologizing and punishing those who do not comply. It is a question that keeps change at arm’s length by requiring it only from others. Not all academic institutions are so willing to waste valuable resources represented by faculty and students of color. For instance, Smith College has spent more than ten years transforming not only its social work department, but the entire college. Administrators, faculty, staff, and students have been transforming every aspect of their program to be not only more inclusive, but also to incorporate an anti-racist stance, a perspective that goes beyond merely incorporating differences by acknowledging privilege and power disparities. Their student and faculty make-up, curriculum, and relationships with outside constituencies have all been reviewed and changed to be more inclusive. Transformation takes the courage to look at one’s own biases and privileges and the willingness to shoulder the hard work of confronting the procedures and practices that keep hegemony firmly in place from one generation to the next. It is my hope that these simple stories will touch readers’ hearts and inspire change. U. S. Census Bureau, Population by Race. Exum, “Climbing the Crystal Stair,” 385. U.S. Census Bureau, “Population Profile of the United States”; Alex-Assensoh, “Race in the Academy,” 5. 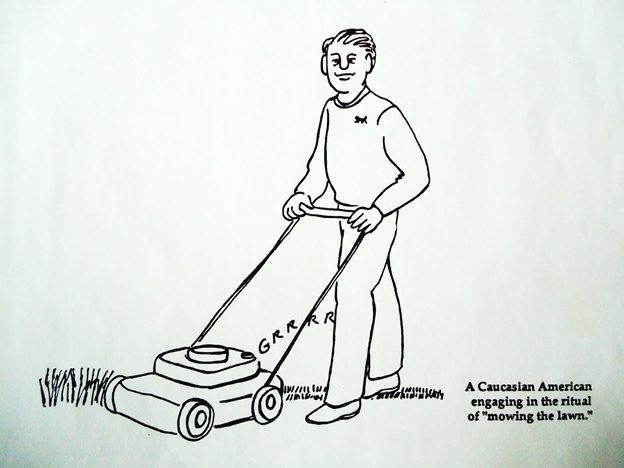 Alex-Assensoh, “Race in the Academy,” 5. Exum, “Climbing the Crystal Stair”; Alex-Assensoh, “Race in the Academy”. Shawn Wilson, Research Is Ceremony. Ross, Dancing with a Ghost. Although I usually avoid simplistic cultural contrasts, evidence from the accounts of Native American faculty cited in this article clearly show evidence that these differing paradigms are significant. The contrasts also reflect the synthesis of an extensive review of literature related to Ojibwe culture and history drawn from ethnographic and historical studies, accounts of explores and administrators, and novels, narratives, and recorded accounts by Ojibwe people. The list of sources is too extensive for this article and is available in Hand, An Ojibwe Perspective. National Association of Social Workers, Code of Ethics. The observations that resulted in these stories were recorded from 2001 to 2011. I began recording them as fieldnotes, a habit developed during my doctoral research, a critical ethnographic study of the child welfare system. For more information on fieldnotes, see Emerson, Fretz, and Shaw, Writing Ethnographic Fieldnotes. For more information about the distinctions between traditional ethnography and critical ethnography, see Thomas, Doing Critical Ethnography. Dreher, The Tao of Inner Peace, 90. Alex-Assensoh, Yvette. “Race in the Academy: Moving Beyond Diversity and Toward the Incorporation of Faculty of Color in Predominantly White Colleges and Universities.” Journal of Black Studies 34, no. 1 (2003), 5-11. Basham, Kathryn K., Susan Donner, Ruth M. Killough, and Lisa M. Rozas, “Becoming an Anti-Racist Institution.” Smith College Studies in Social Work 67, no. 3 (1997), 564-585. Berenberg, Ben Ross. What Am I? New York, Wonder Books, 1946. Brayboy, Brian M. J. “The Implementation of Diversity in Predominantly White Colleges and Universities.” Journal of Black Studies 34, no. 1 (2003), 72-86). Calhoun, J. Anne. “It’s Just a Social Obligation: You Could Say ‘No’.” American Indian Quarterly 27, nos. 1 & 2 (2003), 132-154. Corntassel, Jeff J. “An Activist Posing as an Academic?” American Indian Quarterly 27, nos. 1 & 2 (2003), 160-171. Cross, Suzanne L., Eddie F. Brown, Priscilla A. Day, Gordon E. Limb, Dwain A. Pellebon, Emily C. Proctor, and Hilary N. Weaver. Status of Native Americans in Social Work Higher Education, 2009. Council on Social Work Education, http://www.cswe.org/File.aspx?id=55342 (accessed September 25, 2012), . Deloria, Vine, Jr. “Reforming the Future, Where the Academy Is Going.” Social Science Journal 39 (2002), 325-332. Dreyer, Diane. The Tao of Inner Peace: A Guide to Inner and Outer Peace. New York: Harper Perennial, 1990. Dua, Enakshi and Bonita Lawrence. “Challenging White Hegemony in University Classrooms: Whose Canada Is It?” Atlantis 24, no, 2 (2000), 105-122. Emerson, Robert M., Rachel I. Fretz, and Linda L. Shaw. Writing Ethnographic Fieldnotes. Chicago: The University of Chicago Press, 1995. Essien, Victor. “Visible and Invisible Barriers to the Incorporation of Faculty of Color in Predominantly White Law Schools.” Journal of Black Studies 34, no. 1 (2003), 63-71. Exum, William H. “Climbing the Crystal Stair: Values, Affirmative Action, and Minority Faculty,” Social Problems 30, no. 4 (1983), 383-399. Fenelon, James V. “Indians Teaching About Indigenous: How and Why the Academy Discriminates.” American Indian Quarterly 27, nos. 1 & 2 (2003), 177-188. Hand, Carol A. 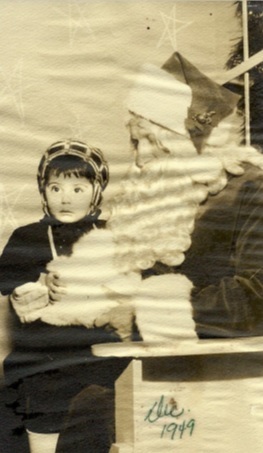 An Ojibwe Perspective on the Welfare of Children: Rescuing Children of Homogenizing America? Unpublished Dissertation, University of Wisconsin-Madison, 2003. Iseke-Barnes, Judy M. “Racist Hierarchies of Power in Teaching/Learning Scenarios and Issues of Educational Change.” Resources for Feminist Research 31, no. 3 (2006), 103-130. Jacobson, Maxine. “Breaking Silence, Building Solutions: The Role of Social Justice Group Work in the Retention of Faculty of Color.” Social Work with Groups 35, no. 3 (2012), 267-286. LaCourt, Jeanne A. “Descriptions of a Tree Outside the Forest: An Indigenous Woman’s Experiences in the Academy.” American Indian Quarterly 27, nos. 1 & 2 (2003), 296-307. Limb, Gordon E. & Kurt C. Organista.“Comparisons Between Caucasian Students, Students of Color, and American Indian Students on Their Views on Social Work’s Traditional Mission, Career Motivations, and Practice Preferences.” Journal of Social Work Education 39, no. 1 (2003), 91-109. Mihesuah, Devon A. “Native Student, Faculty, and Staff Experiences in the Ivory Tower.” American Indian Quarterly 27, nos. 1 & 2 (2003), 46-49. Mihesuah, Devon A. “Activism and Apathy: The Price We Pay for Both.” American Indian Quarterly 27, nos. 1 & 2 (2003), 325-332. Miller, Joshua and Susan Donner. “More than Just Talk: The Use of Racial Dialogue to Combat Racism.” Social Work with Groups 23, no. 1 (2006), 31-53). Nunpa, Chris M. “Native Faculty, Higher Education, Racism and Survival.” American Indian Quarterly 27, nos. 1 & 2 (2003), 349-364. Ross, Rupert. Dancing with a Ghost: Exploring Indian Reality. Markham, Ontario, Canada: Octopus Publishing Group, 1992. Russell, Steve. “From the Bottom of the Education Barrel.” Indian County Today, (2008, March 14). Smith, Pamela J. “The Tyrannies of Silence of the Untenured Professors of Color.” U.C. Davis Law Review 33 (1999-2000), 1105-1133. Stanley, Christine A. “Coloring the Academic Landscape: Faculty of Color Breaking the Silence in Predominantly White Colleges and Universities.” American Educational Research Journal 43, no. 4 (2006), 701-736. Trucks-Bordeaux, Tammy. “Academic Massacres: The Story of Two American Indian Women and Their Struggle to Survive Academia.” American Indian Quarterly 27, nos. 1 & 2 (2003), 416-419. Tatum, Beverly D. “The Complexity of Identity: Who am I?” In M. Adams, W. J. Blumenfeld, R. Casteñada, H. W. Hackman, M. L. Peters, & X. Zúñiga (eds. ), Readings for Diversity in Social Justice: An Anthology of Racism, Anti-Semitism, Sexism., Heterosexism, Ableism, and Classism (pp. 9-14). New York, NY: Rutledge, 2000. Thomas, Jim. Doing Critical Ethnography. Newbury Park: Sage Publications, 1993. U.S. Census Bureau. CensusScope – Population by Race. Retrieved from http://www.censusscope.org/us/chart_race.html (accessed December 22, 2012). White, Carolyne J. and Noreen Sakiestewa,. “Talking Back to the Colonial Institution: Hopi and Non-Native Scholars.” American Indian Quarterly 27, nos. 1 & 2 (2003), 433-440. Wilson, Shawn. Research Is Ceremony: Indigenous Research Methods. Hallifax & Winnepeg, Manitoba, Canada: Fernwood Publishing, 2008. Younger, Virginia C. “A Painful Time: Tenure Trial.” American Indian Quarterly 27, nos. 1 & 2 (2003), 456-458. There are days when revisiting old stories gathered during my research on Ojibwe child welfare makes me feel like I’m descending into a dystopian world. Sometimes the feeling is intensified when I look out of my front window in winter. I once again feel the weight of hopelessness that I felt when I first listened to stories about loss and suffering, and stories about the hopelessness of those hired as healers and helpers. I could walk away from that world, although the next worlds I encountered were not necessarily an improvement. Still, I had the option to leave while they remained. Now I have the time to revisit those memories recorded in old fieldnotes and look for insights and solutions that I’m certain I missed. I struggle with how to explain the context that gives these stories meaning and significance. Take the issue of substance abuse. There are ingrained stereotypes about “drunken Indians” that are used as an excuse for continued colonial oppression. Here’s an excerpt from an earlier post that presents a more thoughtful analysis. Many theories have been formulated to explain child abuse and neglect within what is now the United States. Recently, an eleven-year-old Ojibwe youth won an award for an essay he wrote to explain his perspective as a foster child. (Please refer to Endnote 1 for more information about the request to include this work in my writing.) In his attempt to make sense of his experiences, this young man’s essay expresses both his vision of the future and his theory of causality for child maltreatment. It was a cloudy morning. It had rained during the night, and it was gray and chilly. I was still in pain and tired from my troubled sleep, but I really felt that I needed to keep my appointments, so I took another Tylenol and got ready for the day. I left early (8:40 a.m.) this morning for a scheduled interview with Karen Daley, the alcohol and drug treatment coordinator for the tribe. I was a few minutes early and waited patiently while she took care of some paper work. As I was waiting, I overheard a discussion about a death in the community last night – tribal programs would be closed on Friday as a result. When Karen was ready, she came and led me to her office. Karen replied. “Dealing with drug and alcohol addiction is the beginning – we need to deal with them first. The substance is still controlling people. They will give up their families before their jobs – jobs provide the income they need to buy substances. Their job is the last thing to go, when they can’t make it. “Suicide is linked to substance abuse. When sober, people may think about it, but don’t do it until they are high. “Here, kids – teens – are supposed to be men. Their parents are getting drunk on binges for days, and they are locked out of the home for three days. Who’s monitoring them? Kids can’t control their environment. They don’t want to be pulled out of their homes. They take care of the family – they feel responsible for helping their parents with their substance abuse problems. Kids feel responsible for “keeping the secret” that everyone else knows about the abuse. “A community member, 50 years old, died last night. One of her daughters held a funeral ceremony yesterday. “An ICWA [Indian Child Welfare Act] client was in court yesterday trying to get her kids back. It would be great for the mom to get her kids back – she is doing well. I hope the court can make the right decision. It seemed important to know more about Karen’s background, so I asked her when she began working for the tribe. “I started part time in 99. Case managing is a big part of the job. I put in six billable hours per day in case management. The clients I see have a problem that is identified by social services, by court orders for operating a vehicle while intoxicated, or schools. Only one client is a self-referral. I was working with ICW trying to place kids when there was no ICWA worker. A list of Native American foster homes in the state would be helpful, and even in the surrounding states. Now we have to call every county, every tribe, trying to plug kids in the right place. “In patient treatment for kids is easy. We send kids to a tribal treatment center in South Dakota. The regional IHS [Indian Health Service] staff has been very helpful. Now, we send adults to a tribal treatment center in the state – moms can bring up to three of their children and can stay with them. Women don’t have to go to treatment or leave early because of kids. The tribal treatment center helps arrange school and has on-site nurses. It is arranged like a college campus. Singles are separated from moms, and they receive treatment in the on-site out-patient center. They provide a continuum of care. The centers fax us reports weekly. It is easier to know where to pick up treatment when they come back. Karen shared copies of the assessment and service forms she developed to help identify needs and track follow-up and outcomes. She also shared a number of other materials, some AODA and some general service delivery. At this point in the interview, I stopped taking notes. Karen began speaking of her own family’s history of substance abuse, as well as her own use in the past. She began talking about her mother’s recent death and her relationship with her siblings. She was very upset, and often in tears as she related the history. It seems that the death of the community member yesterday reawakened memories and the interview provided her with a safe environment to share her pain. I listened and comforted her as best I could. She also spoke about a gathering she holds at her house, located on the river in a nearby town. She described it as “a Native American-like ceremony for healing.” She is not happy with her home because of a bothersome neighbor and doesn’t seem to want to stay here. She is from the southeastern part of the state and misses it. She seemed genuinely relieved to have someone safe to talk to, and as we walked out at the end of the interview, she said she would like to get together for dinner some time. I left feeling ambivalent about the non-Indian professionals who find their way to Native American communities. Sometimes, they are wounded and unhappy and seem to be looking for something to believe in, and people who are even more powerless that they can save. Perhaps things will change as spring comes. I wonder if there is the possibility for this tribal community to develop a stable political environment and a clear and compelling future vision that brings community factions together to work toward a common purpose – the well-being of future generations. Yet, even this begins to sound like judgmental and empty rhetoric. I wish Karen well and know that her job is challenging. It continues to trouble me when I encounter professionals who don’t transcend the narrow boundaries of their discipline to understand how their own life experiences affect the types of services they provide or the crucial influence of socio-cultural contexts on clients’ ability to benefit from what they provide. As I revisit this interview, what seems to be missing is an understanding of ecosystems theory, described in an earlier post. The elegance of Uri Bronfenbrenner’s (1979) approach to human development rests in both its multidimensional complexity and its emphasis on the transactional and reciprocal nature of relations between people and their changing environments. As illustrated in figure 1 below, which somewhat oversimplifies Bronfenbrenner’s model, individuals are “nested” concentrically within a series of environmental relationships. While the developing individuals directly participate in both microsystems and mesosystems through their relationships with parents, teachers, and other significant persons, their development is indirectly influenced by systems outside their own experience. Parents, teachers, and other relatives are all embedded in a series of settings (for example, parents’ work, parents’ networks of friends, teachers’ unions, local school boards, etc.) that influence how they relate to the developing individuals. This indirect, external set of influences is labeled the “exosystem” (Bronfenbrenner, 1979, p. 25). All of these systems are embedded within the “macrosystem”, defined as “consistencies, in the form and content of lower-order systems (micro-, meso-, and exo-) that exist, or could exist, at the level of the subculture or the culture as a whole, along with any belief systems or ideology underlying such consistencies” (p. 26). Macrosystems are the blueprint, or the overarching cultural paradigm (Fleras & Elliott, 1992), which determines the content, structure, and goals of the lower level systems in which individuals are embedded. 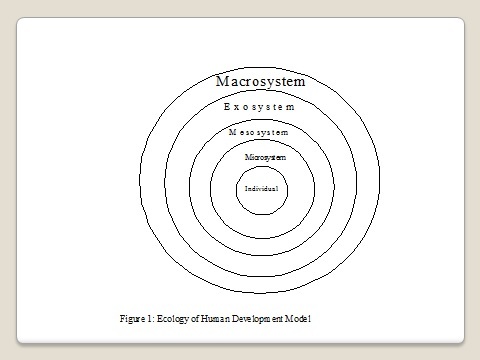 Bronfenbrenner (1979, p. 26) notes that the macrosystems which exert influences on developing individuals “differ for various socioeconomic, ethnic, religious, and other subgroups, reflecting contrasting belief systems and lifestyles, which in turn help to perpetuate the ecological environments specific to each group.” Individuals not only sustain the blueprint, or ‘macrosystem’ in which they are embedded, but are also capable of modifying its content and structure. Given the layers of connection that influence people’s beliefs and behaviors, I doubted that Karen’s interventions with individuals would ever successfully address an understandable, although unhealthy, coping mechanism that temporarily numbs pain in a fog of euphoric forgetfulness. The consequences of oppression and losses are palpable here – an overwhelming sense of hopelessness. Of course, it is easier for professionals to “treat” individuals than it is to “heal” collective historical trauma and effectively resist ongoing colonial oppression that affects every person in the tribal community. So today, I’ll continue to return to an earlier dystopian time. 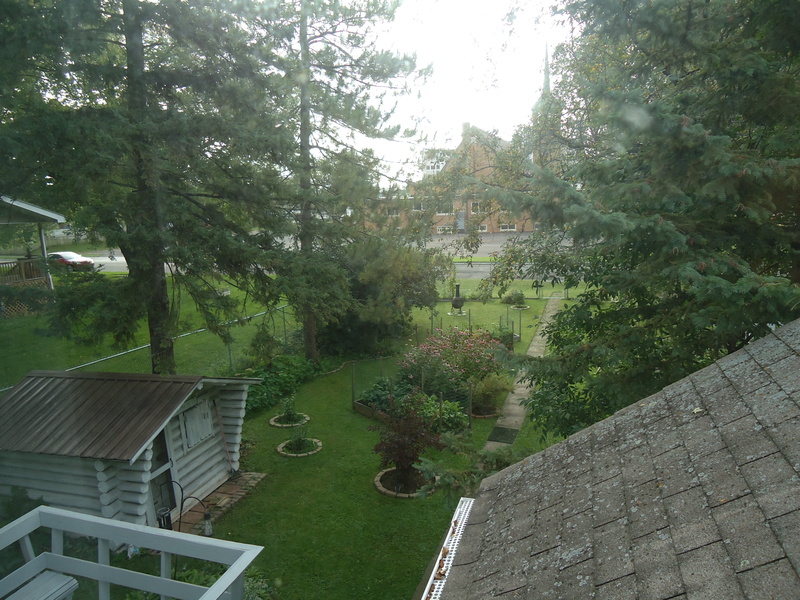 Even though the view from my window is similar to the one a few days ago, I can remember the view on a summer’s day. Bronfenbrenner, U. (1979). The ecology of human development: Experiments by nature and design. Cambridge, MS: Harvard University Press. Fleras, A. & Elliot, J. (1992). The ‘nations within’: aboriginal-state relations in Canada, the United States, and New Zealand. Toronto, Canada: Oxford University Press.